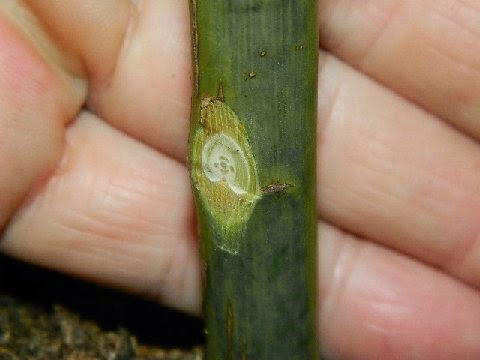 Chip budding is basically slicing upward through the bark to reveal the cambium, then sliding the bud up into the slice. 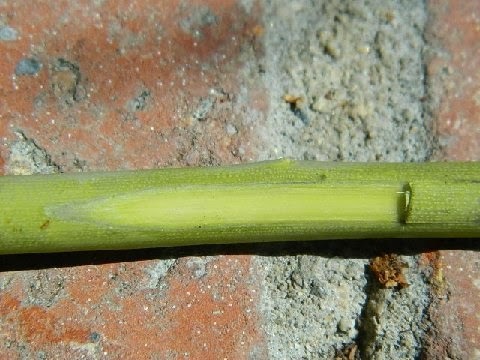 As with T budding, the bud should be the same size or narrower, from a thinner gauge bud stick than the stock. You can easily bud something from a quarter inch thick bud stick to an inch thick stock, but not vice versa. As with any budding or grafting, you need good cambium to cambium contact. 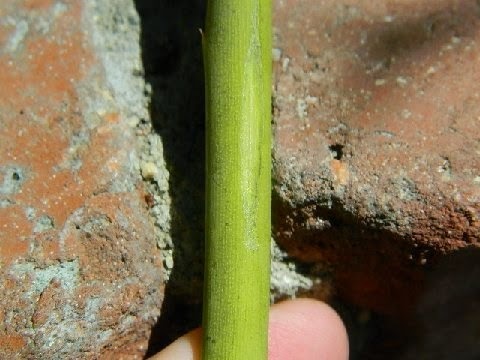 As you know, cambium is the juicy green layer just beneath the bark or skin. It's the circulatory system of the plant. It's basically stem cells. It becomes whatever is needed depending upon what conditions it encounters. It's what calluses to become roots when provided darkness and dampness, as with wrapping cuttings. It becomes scar tissue to heal wounds if left exposed to air. When in contact with other cambium, it knits the two pieces together, forming new capillary action between them so the two pieces become one. 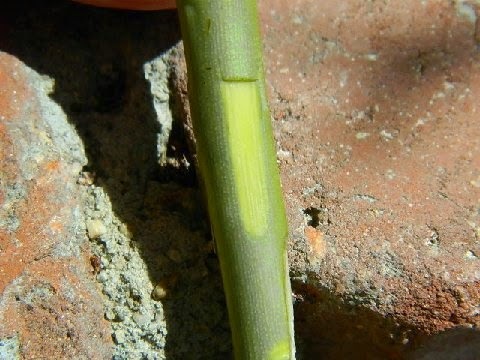 If you push the prickles off a fresh flower stem and then observe the juicy, brighter green tissue exposed where the prickles were, that's cambium. You want to make sure the buds have cambium and not pith behind them. A bit is acceptable and will work, but the more cambium tissue remaining on the bud, the faster and stronger the knit will be. 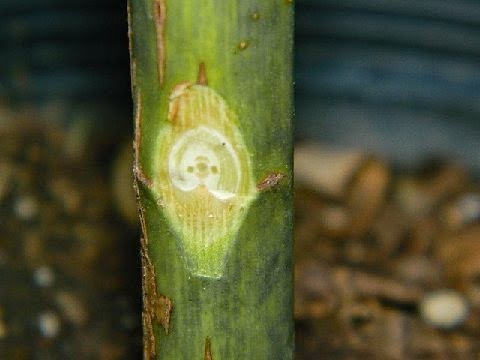 Cambium won't grow to pith and vice versa, so the more wood behind the bud, the greater the chances of failure or of future breakage if the cane suffers trauma or wind stress. 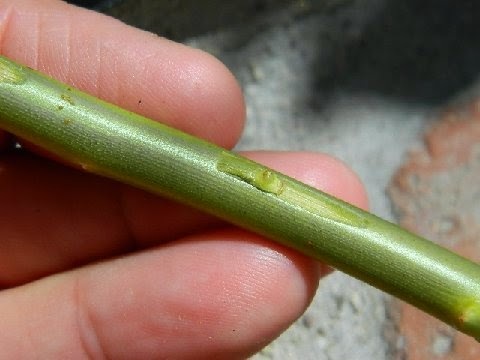 If you practice slicing buds from canes you don't care about, you will quickly learn to see whether there is too much pith or not and how to more consistently remove the buds with the correct tissue behind them. 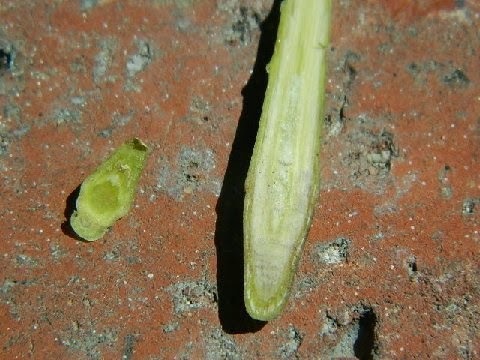 The smaller bud has cambium; the larger has less cambium and more pith. Had I made the cut shallower for the larger bud, there would have been less pith and more cambium exposed. If the brighter green rings around the perimeter of the shield make decent contact with the cambium of the stock, this bud may work, but the smaller one above has cambium across its interior surface, so its chances and speed will be greatly increased over the larger one. 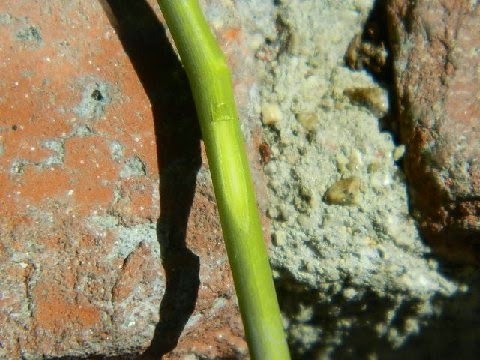 An interesting side line..I've found it is possible to cleave the bud in half top to bottom, resulting in the bud knitting to the stock and growing, as well as the remaining tissue in the original plant growing a new cane. Of course this requires you to harvest the bud from a cane remaining on the original plant. I've done it so I didn't have to remove much wood from a smaller, struggling plant. It's almost like splitting a liver to transplant half of it to another person. Once you've removed the bud or buds you wish to insert into the stock, you need to keep them moist until they are inserted. Mel Hulse, who used to be the volunteer coordinator for The San Jose Heritage Rose Garden, kept the bud on his tongue until he finished the slice to insert it into. I use either a shallow glass of water in which I put the bud stick to prevent it from drying, or a shallow jar lid with water in it. If you drop the bud into a glass or cup of water, you have to dig it out of deeper water which can be frustrating. If it's in a shallow lid or small pan of water, it's easier to remove from the water to insert into the stock. Both bud and scion can be thoroughly wet. It isn't so much water getting in to the slice in the stock as it is dirt and fungal or bacterial contamination from the soil that can cause failure. You may either make the cut in the stock first then harvest the bud or buds, or vice versa. As long as the buds are kept moist, you can wait hours to insert them. 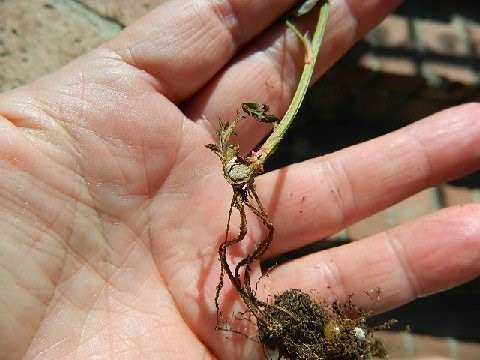 Ideally, you want to de bud your stocks before you root them. It's easier, faster and you'll be less likely to damage the inserted bud removing the buds from the stock. 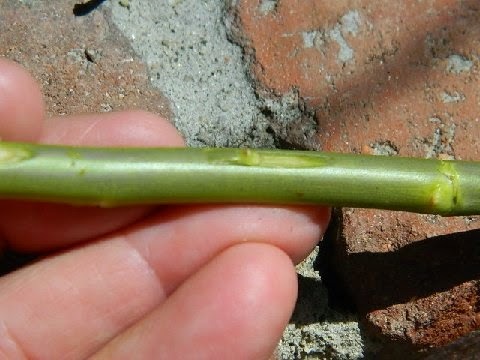 It may surprise you to discover how deeply you need to slice into the stock to remove not only all of the primary bud tissue, but also the guard buds (one on each side of the primary bud) so they don't later become suckers. Making the cut. It may be easier to look at the photos than for me to explain them. Notice the brighter green, juicier rings around the perimeter of the cuts. That is what you want to see on the reverse of the buds and (ideally) across the surface of the cut. If you don't, then you want to match the cambium on the bud reverse to the ring of cambium around your cut edges. All it takes is one contact point for it to knit together and grow. The more contact, the faster it puts out growth and the stronger the joint, but like Brylcreem, "a little dab will do you." Then, tie it in securely. I like the Parafilm products. You can find the Parafilm 1/2" wide budding tape very inexpensively on Ebay. They stretch, increasing the pressure holding the two plant pieces together. That reduces "bleeding" from the wound and allows for a stronger bond. Parafilm also adheres to itself so it doesn't have to be tied to remain where you wrapped it. 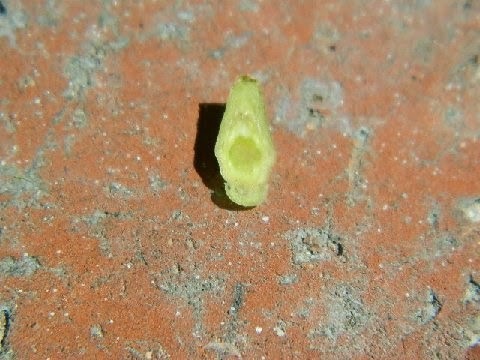 I often even wrap across the bud itself, burying it under layers of Parafilm. 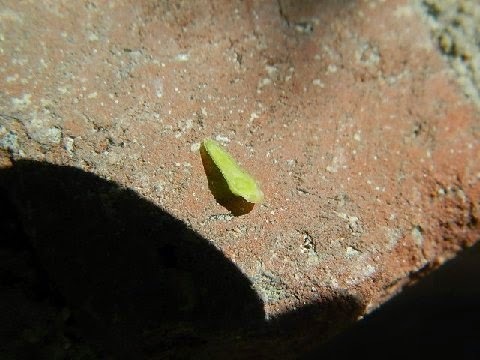 The film deteriorates in the heat, water and Ultra Violet and will begin splitting as the plant thickens. 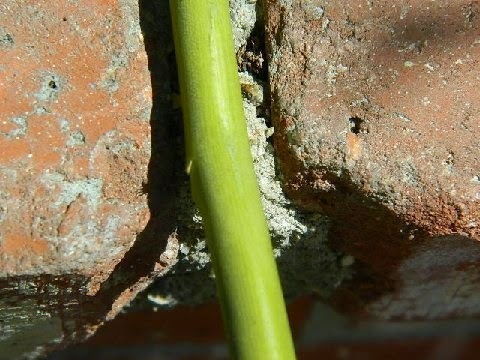 Buds can actually grow through it so you don't have to remove it as the bud grows. Wrapping across the bud also helps prevent it from drying out until it knits to the stock, drawing moisture and nutrients from the stock. You can see the film splitting in this shot. When the stocks are vigorously growing, buds should knit to the stocks in roughly three to four weeks. The less actively they're growing, the longer it takes to knit together and increasing the chances of failure. Often, as long as more mature buds are used and the stocks are growing very vigorously, they will begin pushing new growh at three to four weeks after insertion. 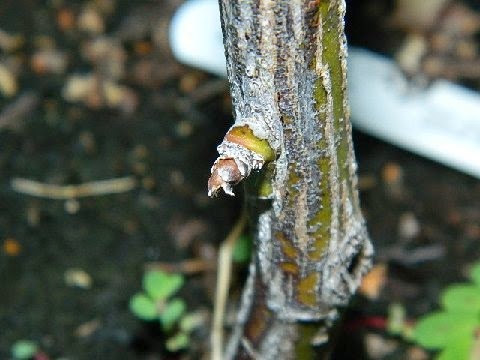 You can actually use fairly mature buds as long as they haven't literally begun unfurling leaves. 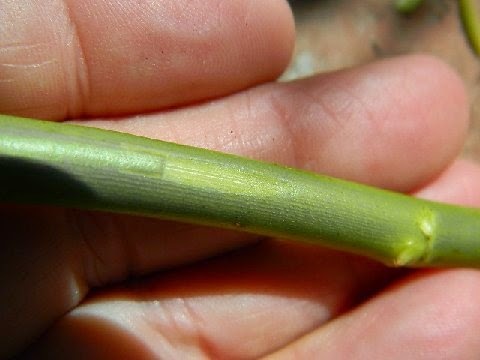 The flatter the bud, the longer it will require to mature and begin growth. After three to four weeks, as long as the buds are still green, they should have taken. You may choose to leave them alone until the following spring/summer if you're concerned they will be too soft to withstand the extremes your winter may give them if it's later in the year. You may do the traditional breaking the tops just above the bud so it remains attached, supposedly continuing to feed the stock and bud until the bud begins growth. Or, you may elect to sever the stock above the bud at the three to four week mark. The main issue I encountered was extreme bleeding from the cuts. I looked for the pruning stick I used to see in the nurseries, but could find none. I didn't want the spray asphalt as it would make a huge mess. I tried tying the Parafilm over the top like a bandage and it worked for a few of the weaker bleeders. I also tried Elmer's Glue, which must be applied either after the sun begins setting or before the sun hits the stocks, as when the sun isn't shining on them, they stop bleeding. Once the sun shines on the stocks, they bleed like mad. What finally worked best was dripping candle wax on the wounds before the sun shined on them so the dried wax would seal the capillaries. Some required several applications to finally fully seal the wounds. Don't worry if you drip wax on the buds. It isn't hot enough, nor enough of a "seal" to harm them. Once I stopped the sap loss, the increased pressure in the stocks began pushing buds like nobody's business! If you have many of the same bud and want to conserve stocks, and if you've rooted longer pieces, you may insert many buds in each stock. You may also root a long whip of a rambler or climber and bud along the more horizontal surface of the longer whip. That will actually push growth faster for the same reason training climbing canes to a more horizontal direction will push lateral growth along the cane. 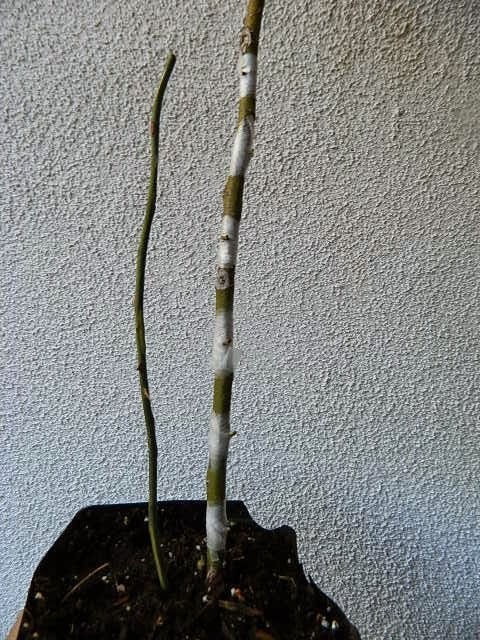 The multiple buds growing on the same stock can be used to provide extra cuttings for own root propagation, or, if you allow enough room between them, once they have knit and begun growing, their first winter they may be separated and wrapped or otherwise treated as individual cuttings, producing individually budded, rooted plants. If you have a mist system set up, you can bud to unrooted stocks, then root them while the buds knit. Sequoia did that for mini standards all the time. 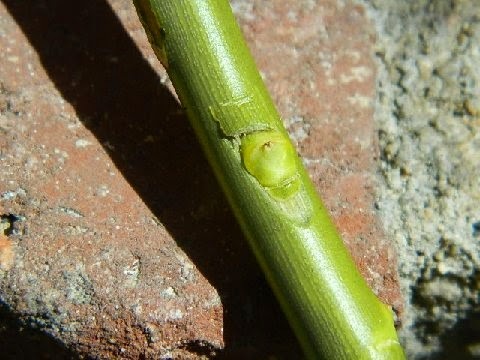 The first cane to grow from the inserted bud is the "maiden". When you read older rose books and they talk about the finest exhibition blooms are from "maidens", this is what they mean. I let them grow out and flower so they are mature when I cut them and so their foliage begins feeding the stock. You have to cut the maiden back pretty far, close to the stock, but leaving a bit of tissue there to potentially provide a few buds from that main cane. 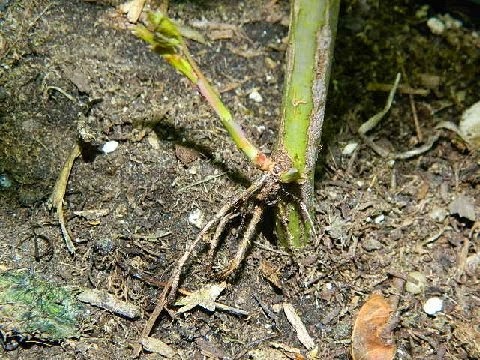 Cutting it back close to the stock encourages the guard buds to break into growth, producing the multi branched growth you look for when selecting a bare root. The "one cane wonder" bare roots are usually un cut maidens. 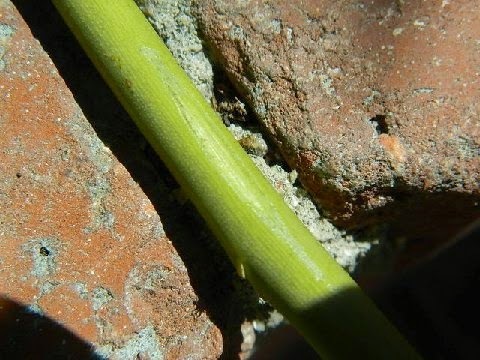 Mistakenly, we tend to leave that original main cane so all future growth comes from it, when we SHOULD cut it back to an inch or so to encourage side branching from the guard buds. See the main bud in the center and the two guard buds, one on either side? That's what you want to cut sufficiently deep to remove when you de bud the stocks to prevent suckers. 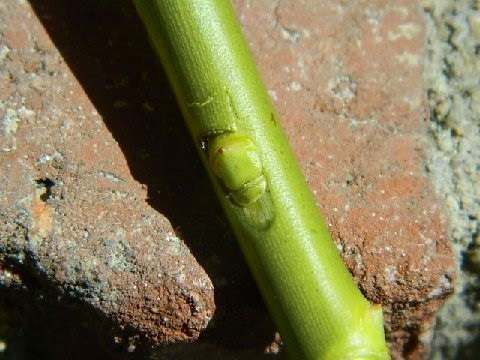 There is enough growth material from all three buds remaining in this stock to produce suckers from all three. Plus, I removed enough material of all three to produce new growth once inserted into a stock. That goes back to splitting a liver above. And, this illustrates why simply cutting a sucker off results in the growth of two or more from that cut, and why they have to be ripped or dug from the stock. This is one I left too long and it actually set out its own roots. You actually don't HAVE to leave the top flap on the cuts to insert the top of the shield under. It makes it easier, but it isn't absolutely necessary. If both the stock and shield (scion) have droplets of water on them, the water will act like glue, causing them to adhere to one another until you tie them in. Don't worry if your results look inelegant. With practice, your 'elegance' ability will significantly improve and it doesn't seem to make a bit of difference to the plants. I have quite a few where there is a lot of scar tissue, thickened cambium, between the bud and stock and they're growing and flowering just fine. Some are going to make Grade 1 budded plants fast. Others will make Grade 2 or 1.5 and take their time. Some of that depends upon the variety, some on the size and maturity of the buds used. Prevailing weather conditions probably play a role, too. As long as you've gotten the stocks growing vigorously, keep them well watered for the next month or a bit longer to keep that sap flowing freely so the buds knit and start growing ASAP. They don't require "full sun" and may even perform better in fewer hours than they normally might in your climate. In the "garden" mine would usually receive six to eight hours of sun. In the front walled garden, they receive only three to four hours of direct sun, with strong, indirect light the remainder of the day. Budding works almost flawlessly in front and fails out back. 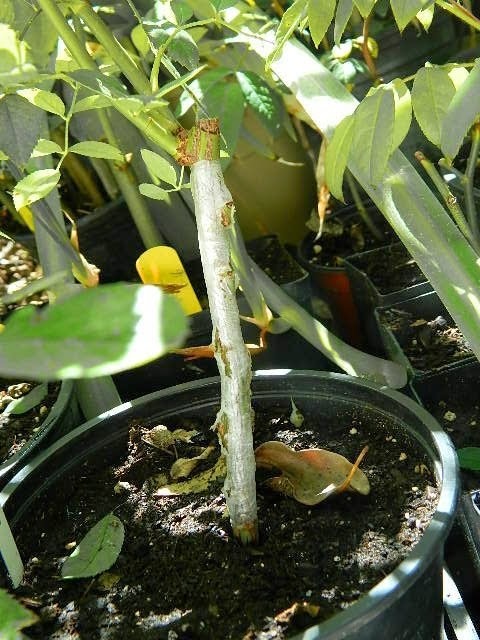 If you really catch the bug for budding, you can raise your own rose seedlings, root pieces from the more vigorous types then bud to them as they would be RMV free and could provide you with a steady source of root stocks. Or, you can plant a mother plant of the type you wish to use and continue rooting pieces of it for each stock you desire. I hope you have an outlet for the extra budded plants you will probably generate. If you're already pretty tapped for room, get ready! You're very likely going to need to start some new rose friendships to take care of your "excess"! Could you expand on your statement of why one would have RMV free plants, as mentioned in your last paragraph ? Yes. 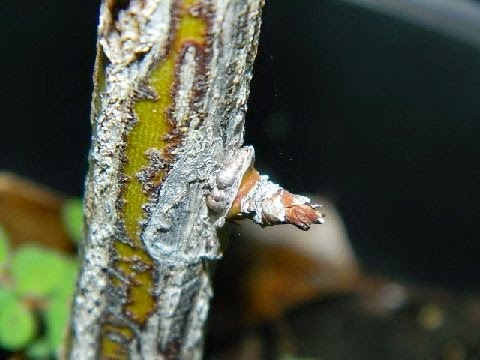 Rose Mosaic Virus is traditionally spread through budding/grafting. 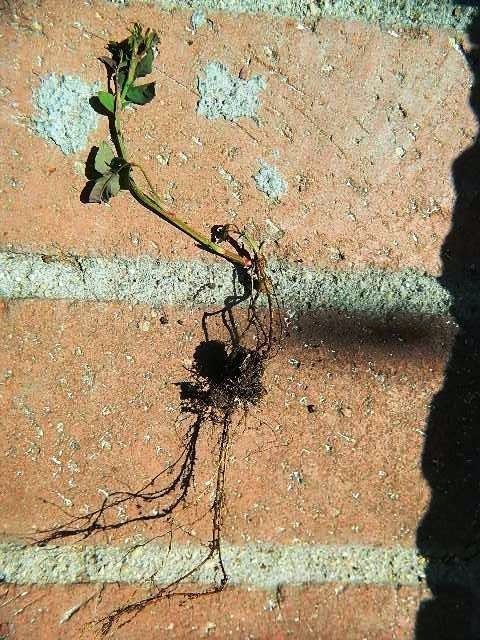 To insure you don't infect roses which aren't already infected, you want to use root stocks which aren't virused. As it hasn't been shown the virus crosses the placenta, seedlings should be free from RMV. That's one reason seedling understocks are popular in European countries. Seedlings you raise should also be free from RMV, so if they root easily and grow well own root, they may be decent to use for stocks. 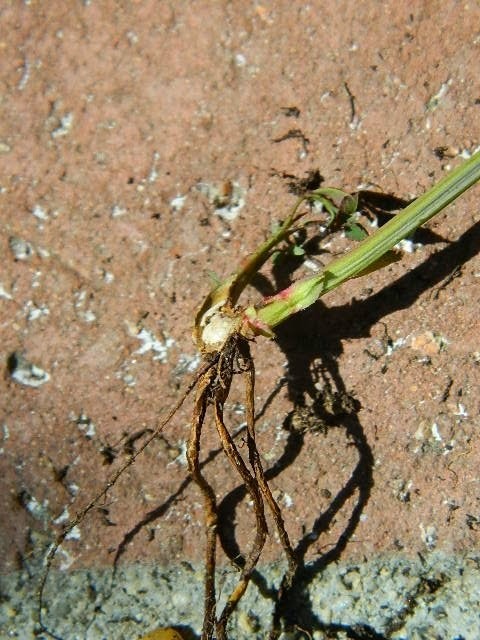 The alternative is to obtain virus treated and tested root stocks from UC Davis or other virus treatment programs, but if you can raise and root your own and they work well where you are, why should you have to? I have two seedlings which germinated this year which are really intriguing me for that purpose. They are prickle-free and EXTREMELY vigorous. Their parents all root easily and from the size of these seedlings and their root system, I'm certain they should root easily, also. Thank you for your reply. I now understand your statement. You're welcome! I know you will have a ball budding! It is EASY and it is FUN! 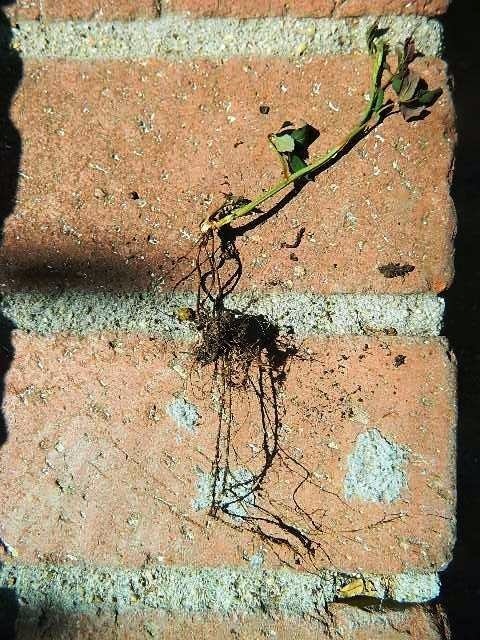 You will be pleasantly surprised at the improvment with many rose varieties putting decent roots under them creates! Good luck! Congtratulations, Liezel! I would carefully check after the three, perhaps four weeks. If they are still green and perhaps swelling, they should have taken. You might see if ordering the Parafilm on EBay is possible for you. They sell the budding tape for only a few dollars, so other duties, postage, etc., shouldn't be too terrible. Good luck! Great stuff. Excellent pictures and commentary.